Travel Mound: Regulation slope for 7 - 12 yr. old pitchers: Great For: TRAVEL TEAMS: Lightweight Design, Small Footprint, Sets up in seconds and folds back up in seconds. 32"L x 18"W x 11"H TEAM PRACTICE: working pitchers and catchers while the rest of the team has the field. GAME TIME: pre-game warmup and bull pen while the game is in progress. TRAINING: teaches pitchers to step toward the plate w/ the narrower landing area of 16". Platform is wide enough to start the pitching motion when pitching from the wind up. 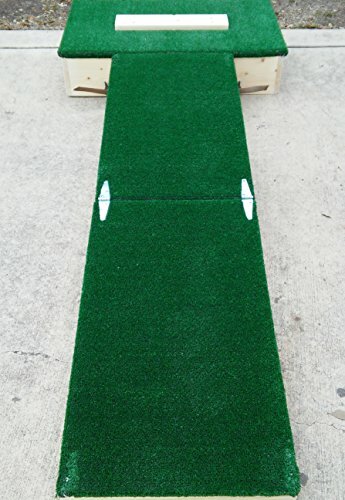 LESSONS Landing area is on the mound with the correct slope for accurate game simulation saving stress on the arm and knee Specs: Weight: approximately 30 lbs. Height: Regulation 6 inches high to the top of the platform. Slope: Regulation 1 in. drop for every 1 ft. length. Length: 5'7" from pitching plate to end of mound. Total Length: 7' Stack Dimensions: 32"L x 18"W x 11"H Stack construction for easy transport in a car, SUV or truck. Secures together with latches and will not come apart when in use but are simple to unhook when transporting. Covering is heavy duty, double backed astroturf. Sanded edges. If you have any questions about this product by Start Right Sports, contact us by completing and submitting the form below. If you are looking for a specif part number, please include it with your message.